More than 60 years ago, Caroline Pratt engaged the help of a pediatrician to develop outdoor equipment for safe, comprehensive exercise in the context of play. The result of Pratt’s pursuit is the City and Country Block Yard Program for ages two through seven. In the Lower School years, children enjoy Yard for up to an hour daily, except in extreme weather. They strengthen their gross motor skills by lifting, carrying, pushing, pulling, building, and disassembling at the end of their Yard time. 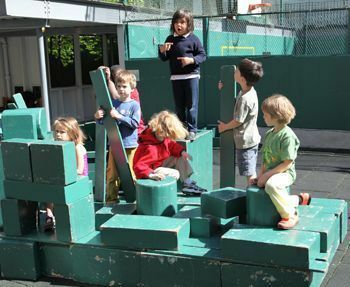 The 2s have their own yard equipped with a sandbox, climbing apparatus, and blocks; the 3s and 4s use a rooftop playground; and the 5s, 6s, and 7s have a separate block yard. Each day, the children have unlimited opportunities to build their own play structures with blocks and other open-ended materials. When children reach the Middle and Upper School, the Yard Program continues on a daily basis, with a focus on physical development and expression, the acquisition of specific physical skills, and social awareness, such as learning to be a good sport. Using the Game Yard, the children are taught a progression of games and traditional sports (soccer, basketball, volleyball, etc.). From this repertoire, a game is chosen each day by democratic vote, and is played for the entire period with no one excluded. A student Yard Leader directs the activity and assumes the responsibility of refereeing the game. Learn the fundamental skills, such as throwing and catching, volleying, and hand and foot dribbling, necessary to participate in many games. Play a variety of tag games to increase cardiovascular endurance. Participate in modified versions of traditional games in small and big group settings. Builds on fundamental skills that help students participate in sports and physical activities. 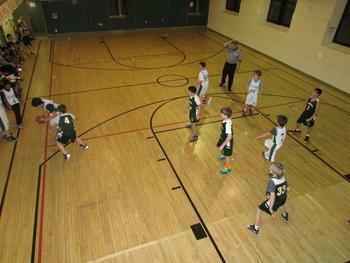 Provides modified and small-sided games to learn rules, skills, and strategies. Emphasizes cooperation, communication, and sportspersonship. Exposes children to a variety of sports such as pickleball, badminton, and Tchoukball, in addition to traditional sports. Teaches fitness and sport-specific exercises. Beginning in the 8s, children may take an optional Early-Morning Yard period that allows for additional skill acquisition, and just plain fun, from 8 to 8:30 AM each day. In Afterschool, Middle and Upper School children have the opportunity to play in Yard with their own and other Groups.